Campaigners delighted as developer's proposals to demolish building turned down. 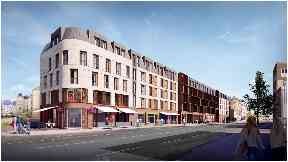 Leith Walk: Hotel plans rejected. Plans to build a new hotel and flats in Edinburgh have been rejected after councillors unanimously backed campaigners fighting the proposals. Drum Property Group wanted to knock down the red sandstone building at Stead's Place on Leith Walk to make way for a 56-bedroom hotel, accommodation for 471 post-graduate students and 53 affordable housing flats. But at a meeting on Wednesday, which lasted more than four-and-a-half hours, contributions from city councillors, community councillors, the developers and campaigners from Save Leith Walk were heard. Councillors then turned down the application, stating the proposals failed to meet more than half a dozen planning policies, and were unconvinced that developers have done enough to try and retain the sandstone building. Concerns were also raised about the mix of housing and student accommodation, while campaigners raised fears about "aggressive lease management" tactics with existing tenants. A spokesman for the Save Leith Walk campaign said: "We are delighted by today's decision. It is a victory for Leith, for Edinburgh and for local democracy. "It is proof that if you organise and engage with local people, if you stay positive and refuse to give up, then you can have a say in how your area is developed. "Rarely has Leith's motto 'persevere' been more appropriate. "We would like to thank the councillors for listening to the people who elected them, opposing the demolition and recognising that the proposed development was wholly inappropriate for this site." Drum Property Group said it would consider appealing the councillors' decision. Graham Bone, managing director, said: "We are naturally disappointed, but not surprised, that councillors chose to ignore the recommendation of their officers to approve our transformational planning proposal for Stead's Place. "We remain wholly committed to developing the site, and view today's decision as another step in what could be a long process. This will include the possibility of lodging an appeal with the Scottish Government. "It's a shame that Leith will be deprived of much needed new homes, facilities and improved amenity whilst that process is ongoing."